Watercressis a leaf vegetable which we can find in our markets and grocery stores, but it grabs our attention quite rarely. Unfortunately, this is one of the most underestimated veggies, which has very high nutritional value. Like his healthy, nutritious and commonly used relatives, broccoli and cabbage, it has numerous health benefits and known as one of the oldest green vegetables used since the times of Egyptian Pharaohs. 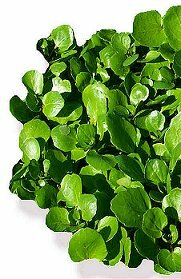 Watercress has a wide variety of culinary applications and can be added to soups and salads, used for sandwiches and so on.